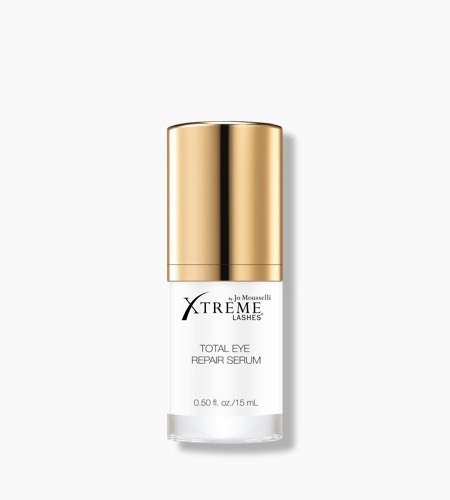 Address fine lines, wrinkles, sagging skin, and puffiness with an advanced multi-tasking eye care solution from Xtreme Lashes by Jo Mousselli. This concentrated, oil-free serum has been clinically proven to hydrate, visibly firm, and reduce the appearance of aging on the delicate skin under the eyes and on the eyelids. Utilizing a powerful multi-peptide complex, this cutting-edge treatment helps promote skin's natural regenerative properties, resulting in more youthful-looking eyes. Multi-peptide Complex reduces the appearance of fine lines and wrinkles by promoting skin's natural mechanism to signal collagen production. This technology also helps prevent collagen breakdown triggered by naturally occurring enzymes that cause skin aging. MicroLift Complex provides instant and long-term benefits by improving tone and texture. Cork oak extract forms an invisible matrix on the skin's surface to visibly lift and firm the eye area, while redensifying peptides penetrate deeper layers to restructure the look of sagging skin. Hyaluronic Sponge Delivery System utilizes microscopic hyaluronic acid sponges to carry active anti-aging ingredients into the skin. This hyaluronic acid network provides continuous hydration and delivery of active anti-aging ingredients through a sustained release system. In an independent clinical study, 86% of participants felt significant improvement in skin firmness after just 6 hours. Dermatologist and Ophthalmologist tested. Hypoallergenic. Compatible with Xtreme Lashes Eyelash Extensions. Insider Tip: Apply Hydrating Under Eye Gel Patches after Total Eye Repair Serum to lock in moisture and boost anti-aging properties.